The O Lau River flows through Hai Lang District in Quang Tri Province. Along its banks is historic Luong Dien Village, one of the oldest villages in the province. In 1508, people migrating from Tonkin settled in this area and founded a small village named Ke Lang. Called Luong Phuc in the 18th century, the village was chosen by the Nguyen Lords as the location to be their headquarters and army base for their conquest of the south. Luong Phuc was again renamed as Luong Dien in 1804; two years after Emperor Gia Long – the first king of the Nguyen Dynasty – ascended the throne. The village was made up of seven clans of families who lived together. Each of these clans built a temple to worship their own clan ancestry. During the two wars against the French and the Americans, all of these temples were destroyed. 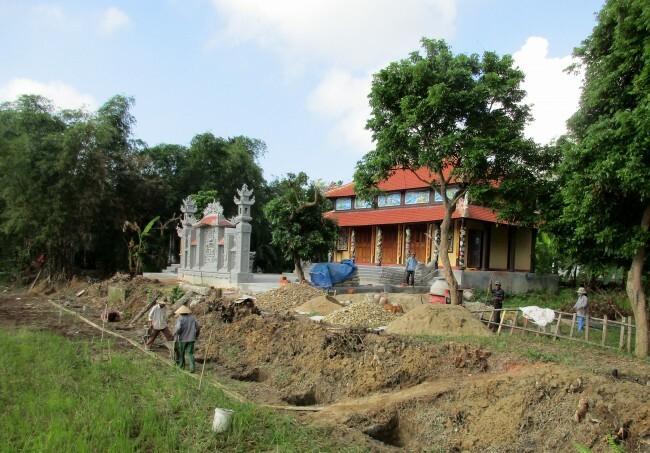 In August 2015, the Nguyen Ton clan started rebuilding their temple with contributions collected from its member families. The work was near completion when a cluster bomb was found, creating an emergency situation. All activity ceased immediately. 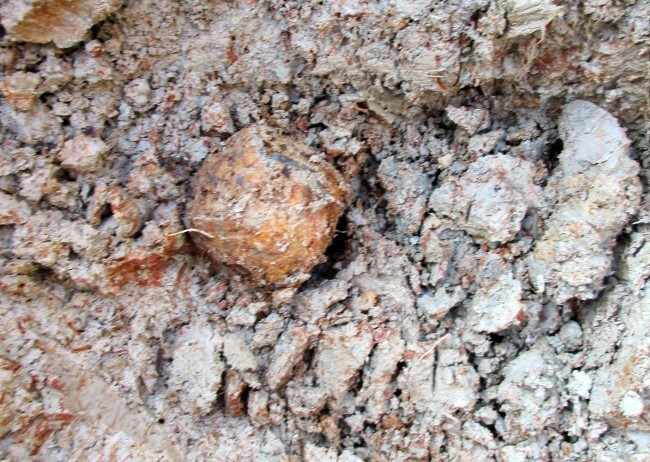 The cluster bomb was discovered on the morning of Monday, 26 October as workers were digging a foundation for the temple wall. Mr. Nguyen Ton Luy, a 60-year-old villager who was elected by the clan to supervise the construction, knew immediately what the device was, and he knew it was lethal. He stopped the workers from any further activity and put in a call to Project RENEW’s hotline to report the discovery. Within an hour, Project RENEW / Norwegian People’s Aid EOD Team No. 1, which was already operating in Hai Lang District not far away, arrived at the construction site. Mr. Luy greeted team members and led them to the location where the wartime ordnance was uncovered. EOD team members quickly evacuated everyone in the area to a safe distance and started their work. 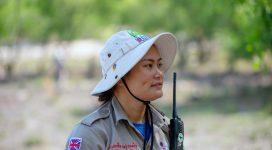 Team Leader Le Xuan Tung checked the device and confirmed that it was a BLU-26 cluster bomblet, which Mr. Luy had correctly identified thanks to the extensive Risk Education training that RENEW has carried out in Quang Tri Province. Because the item was unstable and extremely dangerous, Tung ordered his team members to destroy the bomb in place. 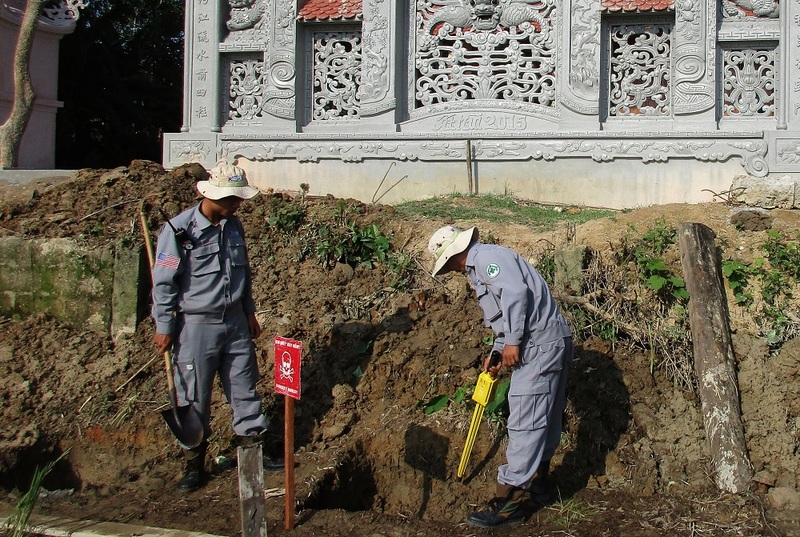 Half an hour later, after the bomb was safely disposed of, EOD Team Leader Tung informed Mr. Luy that he could allow his workers to resume construction of the temple. 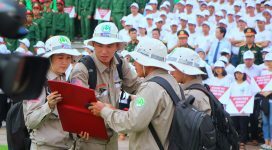 “Cluster bombs are deadly weapons that account for nearly 40 percent of the total deaths and injuries in Quang Tri Province since 1975,” Tung reminded Mr. Luy as he thanked him for the timely call-in. “It is really important that local people stay constantly alert so they can provide life-saving information to our teams, so that we can destroy these bombs as quickly as possible,” he added. 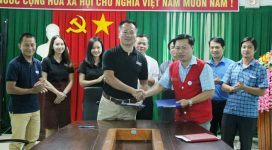 Tung said based on the discovery of this cluster bomb, he will recommend that Project RENEW’s work plan be amended and a technical survey team be deployed in Luong Dien Village, to map out the contaminated area that needs full clearance.